With a new, “portable” atomic clock, scientists are measuring not what time it is but changes to time itself. What do I mean? 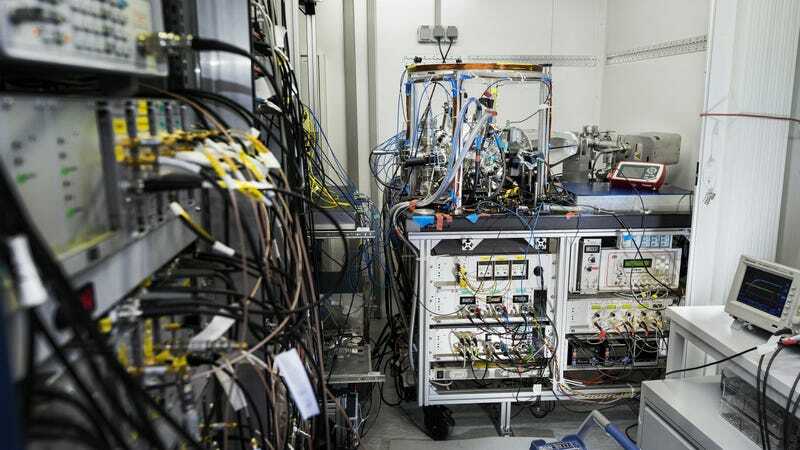 Researchers from a group of European labs have tested a next-generation atomic clock that’s not bound to a laboratory. It’s not something you’ll ever wear on your wrist, but it could one day make important measurements of the shape of the Earth and even dark matter. “It was a proof of concept that optical clocks can be used as sensors for gravitational potential,” Cecilia Clivati, one of the study’s authors from Italy’s National Institute for Metrological Research, told me. The clock part of the experiment is still bigger than a microwave, and must be mounted in a trailer. It’s not the first portable atomic clock, but it is the first portable optical clock, the next generation of incredibly precise atomic clocks. This clock consists of strontium atoms held in place by lasers, cooled to just above absolute zero. Another laser excites the atom, and the interaction between the atom and laser creates oscillations of the atom’s electrons. Counting the oscillations, quadrillions per second, lets scientists calculate the time. These clocks can do pretty awesome physics. They’re used to measure gravity’s strength, since stronger gravity makes time move more slowly. The researchers drove the clock to a spot high in the French Alps, made their measurements, then drove it to lower-altitude Turin and measured again, according to the paper published in Nature Physics. Perhaps one day, these clocks could be used to create more precise maps of the Earth based on varying gravitational strength. They may even be useful for measuring dark matter, the stuff that seems to account for six times more of the Universe’s mass than regular matter does. Because scientists can only spot dark matter via its gravitational force, a super-precise clock might be able to detect it for the first time on Earth.